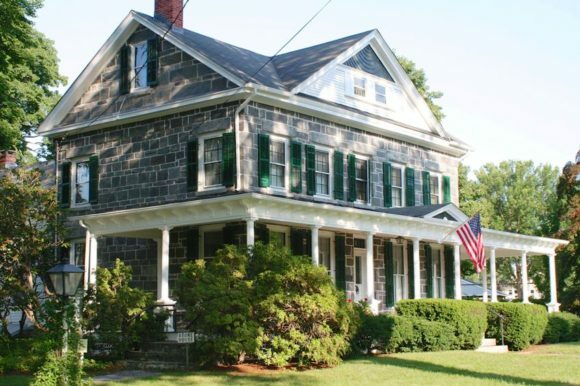 Stone House, owner by the Deep River Historical Society, opens July 1. DEEP RIVER — The Deep River Historical Society presents an opportunity to step back in time. This house and property is considered the crown jewel at 245 Main St., Deep River. The Stone House was built in the 1840’s by Deacon Ezra Southworth for his bride. Three generations of the Southworth family have lived here and left their mark on Deep River. Ada Southworth Munson bequeathed the family home to the Deep River Historical Society in 1946. It has since been used by them to highlight the town’s history along with offering events and community interaction. There are many exhibits that showcase the lives of the family; sea faring stories to the Industrial Revolution, lace and textiles and of course the history of ivory in the area. There is a World War I exhibit that tells of the Deep River “boys” in the Great War, which dates back 100 years. The small settlement of Winthrop (in the northwest corner of Deep River) and is featured also with recent research updated. Come and stop in for a free visit throughout the summer, Saturday and Sunday afternoons from 2 to 4 p.m., starting Saturday July 1st. Greeters will be available to help with making the self-guided tour a learning experience. Call the DRHS at 860-526-1449 or the curator Rhonda Forristall, at 860-526-5086.